New Delhi, January 25th 2019: Students and teachers of South Delhi Municipal Corporation Co-Ed Primary School, near Okhla Water Tank (Deepalaya School Quality Enhancement Programme in collaboration with South Delhi Municipal Corporation), today celebrated 70th Republic Day of India with a lot enthusiasm. 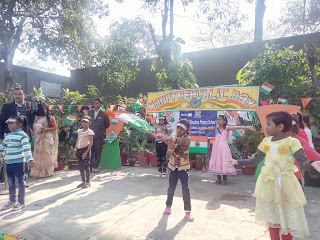 In sync with the festive vibes, the school premises were decorated with tri-colour balloons and flags, and the tiny tots were given special tri-colour badges. Needless to say, the spirit of patriotism could be felt in the air. Mr. Ram Pal, Councillor of Said-Ul-Ajab constituency, was present as the chief guest on the occasion. He hoisted the national flag and motivated the students to be responsible and contributing citizens of the nation, and told them to take a pledge for being torchbearers of “Swachhata Mission” in their communities. Mr. A J Philip, Secretary and Chief Executive, Deepalaya was also present at the event. Manish, a student of the 5th standard performed a welcome dance on “Swag Se Swagat”. While students of the KG class dressed up colourfully to depict the national symbols of India (national bird, national animal, national fruit, etc. ), a cute fancy dress ramp walk by the students of Nursery class overjoyed the audience. Another special highlight of the day was a skit by the boys of the 4th standard portraying the courage and valour of the soldiers of Indian Army. Children from various classes put up spectacular group dances and patriotic songs like Hind desh ke niwasi, and Saare Jahan Se Accha, and Hum Hai Indiawale. All the students of the school sat through the entire programme with rapt attention and joined in the national anthem that was sang collectively towards the end of the function. Apart from more than 120 students studying in the school, around 30 mothers from the community also joined the celebrations. Refreshments were distributed after the culmination of the cultural programme. The school is being run jointly with the government teachers by Deepalaya, the largest operational NGO in Delhi-NCR, under the aegis of School Quality Enhancement Programme (SQEP) of the South Delhi Municipal Corporation. Considering the poor quality of education in the governments schools, South Delhi Municipal Corporation (SDMC) launched the school quality enhancement programme (SQEP) wherein SDMC identifies and partners with non-profit organizations with proven track record of working in the education. As a part of the project, Deepalaya NGO has collaborated with SDMC for running their SDMC Primary School located near Okhla Water Sewage Treatment plant. The idea is to improve the quality of education, devise innovative curriculum, increase the enrollment and improve learning levels. The students enrolled in the school come mostly from economically weaker sections and nearby slums. Over the last two years (after Deepalaya stepped in), the project has shown tremendous improvement in terms of student attendance and retention after Deepalaya stepped in. The learning levels of children have improved significantly. Students and parents are now taking keen interest in the school, its activities, etc. The school strives to act as a demonstration model for the government. Deepalaya is an ISO 9001:2008 certified non-government organization that believes in enabling self reliance and is committed to working on issues affecting the urban and rural poor, with a special focus on women and children. The NGO was started on July 16th 1979 by seven founding members, and for more than three decades, has been contributing to the crusade against illiteracy. Over the years, Deepalaya has established several projects in the areas of Education (Formal/Non-Formal/Remedial), Women Empowerment (reproductive health, SHG, Micro-finance), Institutional care, Community health, Vocational training, etc. These projects are operational in Delhi, Haryana, Uttar Pradesh, Uttarakhand, Telengana, and Maharashtra.